If you think Chinese New Year celebrations are only to be enjoyed in China, think again! Arguably the most widely celebrated holiday in the world, Chinese New Year is observed from Sydney to San Francisco, and everywhere between. 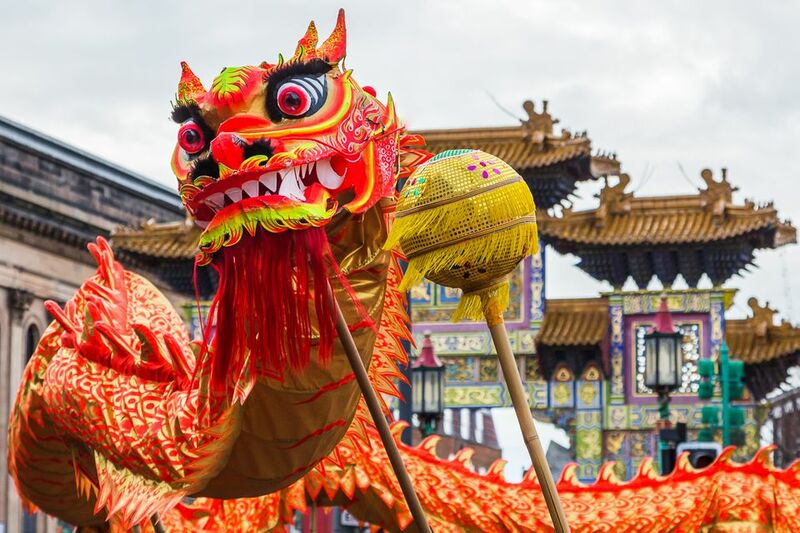 First learn about Chinese New Year traditions to understand the holiday better, then read on to find the largest Chinese New Year celebrations in the world! How Long is the Chinese New Year Celebration? Although Chinese New Year is technically fifteen days long, typically only the first two or three days of the festival are observed as public holidays with schools and businesses closed. Chinese New Year ends on the 15th day with the Lantern Festival -- not to be confused with the Mid-Autumn Festival which is sometimes also referred to as the "Lantern Festival." Most places in Asia begin the celebration on the eve of the first day of Chinese New Year; many businesses may close early to allow families more time to convene for dinner. Chinese New Year is based on the Chinese lunar calendar rather than our own Gregorian calendar, so dates change annually. For this year's dates, see when is Chinese New Year. Large fireworks displays can be seen on the eve of Chinese New Year, with parades and more festivities starting the next morning. The evening before Chinese New Year is typically reserved for a "reunion dinner" with family and loved ones. The first two days of the festival will be the most spirited, as well as the 15th day to close out the celebration. If timing caused you to miss the opening days, be ready for a large parade, masses walking with lanterns in the streets, acrobatics, and a big bang on the last day of Chinese New Year. During the build up to Chinese New Year you'll find special markets, sales promotions, and lots of shopping opportunities as businesses hope to cash in before observing the holiday. Learn the right way to shop in Asia. Aside from China -- the obvious choice -- these places in Asia have large, resident Chinese populations; they are guaranteed to throw a Chinese New Year Celebration that you'll never forget! Georgetown, Malaysia: The city of Georgetown in Penang, Malaysia, prides itself on having the largest Chinese New Year celebration in Southeast Asia. Read about Chinese New Year in Penang. Singapore: Unsurprisingly, Singapore also claims to have one of the largest Chinese New Year celebrations in Southeast Asia. Learn more about Chinese New Year celebration in Singapore. Vietnam: Chinese New Year is celebrated enthusiastically in Vietnam as Tet Nguyen Dan, or just simply Tet. Expect a big bash in Hue, Hanoi, and Ho Chi Minh City (Saigon). See what is Tet. Borneo: Both Kuching in Sarawak and Kota Kinabalu in Sabah are home to large, ethnic Chinese populations; time your nature excursions to ensure that you see the peak in one of the capital cities. Read about other exciting festivals in Borneo. Thailand: Thailand is made up of more than 10% descendants from ethnic Chinese; expect large festivals for the lunar new year in Bangkok's Chinatown and to a lesser extent, Chiang Mai. Kuala Lumpur, Malaysia: Ethnic Chinese are the largest minority in Malaysia's metropolitan Kuala Lumpur; you'll find a parade, fireworks, and grand celebration near the Central Market in KL Chinatown. Learn more about enjoying a Chinese New Year celebration in Southeast Asia. See what to expect from Chinese New Year in Hong Kong. If you can't make it to Asia for this year's celebration, don't worry: nearly every large city in the US and Europe will observe Chinese New Year to some degree. London, San Francisco, and Sydney all claim to have the largest Chinese New Year celebration outside of Asia. Crowds of more than half a million flock to watch the cities trying to outdo each other! Expect big parades and an enthusiastic celebration in Vancouver, New York, and Los Angeles as well. Learn how to say happy new year in Chinese. Unfortunately, travel in Asia during Chinese New Year can be pricey and frustrating as accommodation fills up and transportation services become limited. If visiting any major city in Asia during the festivities, plan well in advance! Make your online bookings as soon as possible and allow extra time in your itinerary for the inevitable holiday delays. Expect unusually heavy traffic and transportation delays in the days leading up to Chinese New Year as locals return to their birthplaces for reunions with family. Is Southeast Asia's Chinese New Year Better than the Original?